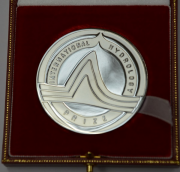 The International Hydrology Prize is awarded annually jointly by UNESCO, WMO and IAHS to an individual in recognition of an outstanding contribution to the science. The 1999 Prize was presented at the first Plenary session of IAHS during the IUGG Assembly at Birmingham. The following citation was written by Dr Tad Pfeffer and presented by Dr John Rodda. Mark Meier, perhaps more than any other North American scientist, has in the past 40 years led way to the recognition of the role of the world’s glaciers and ice sheets in global hydrology. The recognition of terrestrial ice masses as significant components of hydrology is universal today, but this has not always been the case. In a standard US hydrology text from 1949, a presentation of reservoirs in hydrological cycle included mention of atmospheric storage, surface detention, groundwater, oceans—everything but glaciers. The science of hydrology is very different today in many respects, but the prominence of glaciers and ice sheets, and the understanding of the role of glacier mass balance and glacier dynamics in hydrology and sea level change in particular, owes a great deal to Mark’s efforts. Mark received his PhD from Cal Tech in 1957, studying glacier dynamics on the Saskatchewan Glacier under the supervision of Bob Sharp. From 1956 to 1985, he led the Glaciology Research Group within the US Geological Survey’s (USGS) Water Resources Division. During this period, he established mass balance measurement programs in 1956 on Blue Glacier in Washington’s Olympic mountains, and in 1957 on South Cascade Glacier in the Washington Cascades. The South Cascade mass balance record is now the longest continuous record in North America. Beyond mass balance measurements, Mark conducted a variety of glacier dynamics investigations on mountain glaciers in North America and Europe and in Greenland and Antarctica. He was also one of the pioneer figures in the application of remote sensing to snow and ice, with publications in this area going back to 1966. The Columbia Glacier research program was started by Mark in the mid 1970s, and maintained by him and his USGS group through the mid 1980s, during the early and dramatic phases of the retreat of this Alaskan calving glacier. In 1985 Mark left the US Geological Survey to become the Director of the Institute of Arctic and Alpine Research at the University of Colorado. He retired as Director in 1994, but remains an active member of INSTAAR, where his involvement in Columbia Glacier and global glacier mass balance syntheses continues today in current research programs based at the University of Colorado. While glaciers form the focus of Mark Meier’s research efforts, his career in science and service to the scientific community is truly remarkable for its breadth. His affiliations, appointments, and awards are too numerous to mention in full, but some highlights give an indication: he is the recipient of the Horton Medal of the American Geophysical Union, the Seligman Crystal of the International Glaciological Society, Distinguished Service Award (Gold Medal) of the US Department of the Interior, three medals from the USSR Academy of Sciences; he was a lead author on the 1995 Scientific Assessment of the Intergovernmental Panel on Climate Change; he has served (frequently as chair) on committees for the National Academy of Sciences, National Science Foundation, the American Geophysical Union Committee on Snow, Ice, and Permafrost, the Scientific Committee on Antarctic Research, the Working Group on Combined Glacier Basins, International Hydrological Decade. He has served as Vice-President of the International Glaciological Society, President of the International Commission on Snow and Ice, and not least, President of the International Association of Hydrological Sciences. All this in addition to his 200+ scientific publications during a 40 year career, stewardship of the USGS Glaciology Research Group for 30 years and the Institute of Arctic and Alpine Research for 10 years. An aspect of Mark Meier’s unique contribution to hydrological sciences which is not so easy to describe by lists of accomplishments is the scope and perspective of his career. Mark was brought into glaciology and hydrology by a generation which included Bob Sharp, Luna Leopold, and Walter Langbein, and he continues today in active collaboration with the newest generation of hydrologists and glaciologists. This perspective and breadth of experience have been invaluable resources—and sources of inspiration—for his colleagues and students. Mark Meier’s approach to science encompasses many years and many ideas. His use of such a broad perspective has always been creative, artistic, lucid, comprehensive. The International Hydrology Prize is a very fitting and well-earned honor; hydrology and glaciology are better places for his efforts. Thank you very much for this singular honor! I have been truly blessed! It is especially nice that this honor has been bestowed on a snow and ice researcher. In many respects the whole subject of glaciology—snow and ice science—can be considered as an integral part of the hydrological sciences. However, the intersection of the scientific interests of liquid water hydrologists and glaciologists is not always complete and this can be a sensitive issue. Therefore, the award of this prize by IAHS/WMO/ UNESCO will help sustain a good and productive relationship among these scientific communities. I have to acknowledge the wonderful help I have had in developing a satisfying career: My first mentor, Bob Sharp, taught me how to think and question scientific authority. Luna Leopold and Walter Langbein showed me that there were some really interesting scientific problems and opportunities in hydrology. Friedl Hoinkes enlightened me about glaciers and climate and taught me how to deal productively with the international corps of glaciologists. John Nye and John Glen helped me enormously in the fascinating field of ice dynamics. And many more. My work in the International Association of Hydrological Sciences was greatly facilitated by the then Secretary General, now the President, John Rodda. But most important to my success: the 44 years of love and support of my wife Barbara! If my research has been successful, it is not because of any particular brilliance or insight, but because of a willingness to look at a broad, interdisciplinary view of science. Perhaps I may be permitted to offer some advice to the new generation of researchers: learn and contribute to your own field, but also sample the flavors of other fields. Many opportunities exist at the interfaces between disciplines. Many important new tools—mathematical, theoretical, analytical, observational—developed in other fields can be transferred to create new opportunities in your own field. The beauty of meetings such as this IUGG Assembly is that they allow us to sample a broad range of earth science flavors, and we can all take advantage of this. In addition to expanding one’s disciplinary horizons, meetings such as this point up the reality of global change—not just global warming. The Earth is a-changing, as your President pointed out, and we should keep our eyes on our ever-changing and interacting land–sea–ice–atmosphere system. Again, I am truly honoured, and I thank you very much for this fine award!